It is always a pleasure to offer ! 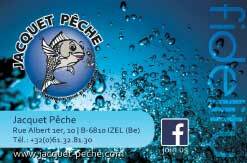 Whatever is the opportunity, Jacquet Pêche proposes you its personalized gift vouchers. The value of the gift voucher is determined by yourself. The gift voucher will be valid for one year from the issue's date. A fidelity card, valid only in store, allows you to get an immediate discount of 5% on all material*. This card will also give you the opportunity to receive, by e-mail, a gift card for your birthday. Its cost is 2.50€. *excepted promotions, net prices, bait, alive baits, fishing society cards and trash bags from the Commune. Each customer of our website will have the chance to get special offers and regular discounts, independant from offers in store.